So, my new laptop has arrived. According to the manual it comes with a Sound Blaster X-FI MB5 sound card and it has a built in subwoofer. Unfortunately I haven’t been able to get the subwoofer working and the general sound quality is rather poorish. Any ideas how to get that soundcard and the subwoofer working properly? first i would take a look what alsamixer gives you, may subwoofer is muted ? The subwoofer isn’t even listed in alsamixer. Do you have alsa-firmware installed? alsa-firmware was not installed. Installed it, rebooted, no change. Already checked pavucontrol, no subwoofer visible there either. is there a subwoofer inside the machine, or you can plug one like a surround system? The subwoofer is built into the case of the laptop. 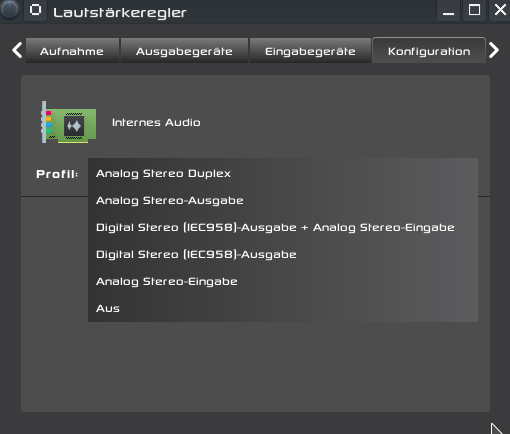 I have noticed that there is a digital stereo iec 958 device available, but whenever I switch to it, the whole sound gets muted. If I switch to digital stereo iec 958 in plasma-pa, I have no sound at all. Bass stays mute though, all other channels give me some noise.